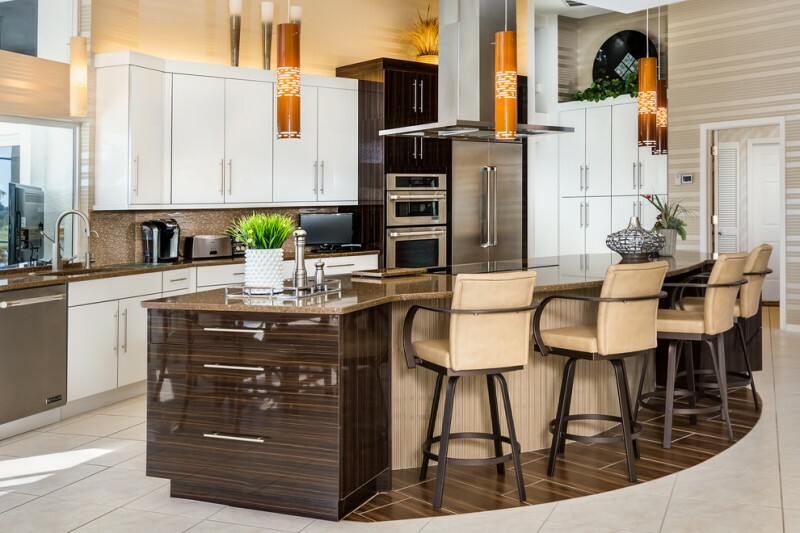 A kitchen island is a must-have part of all modern kitchen nowadays. 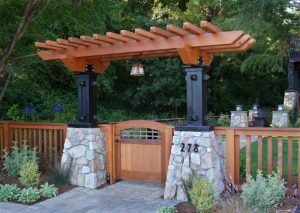 You can find various designs of the kitchen island. It has many functions. 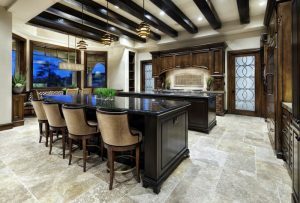 A kitchen island can define the dining and cooking space, provide an additional eating space, serve some storages for the kitchen utensils. 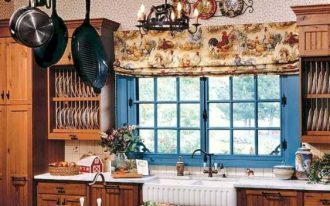 It may provide a sink with the best faucet, stove, built-in microwave, and dishwasher. If you have a problem with the space size or want to have a unique kitchen island, you can get a curved kitchen island. 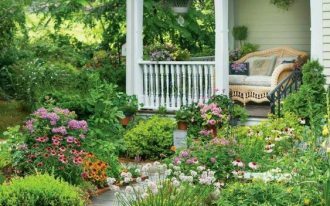 It will provide a casual seating in the kitchen and extra counter space. 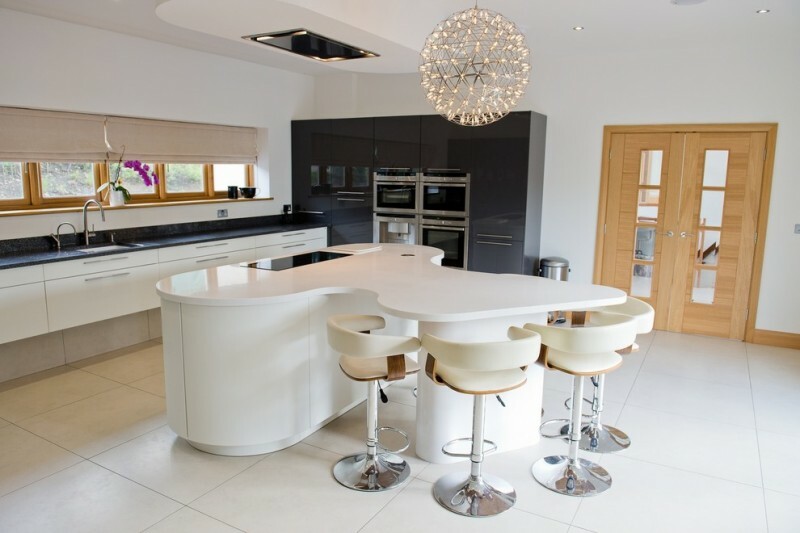 Here are some beautiful curved kitchen island ideas that you can get for your kitchen. 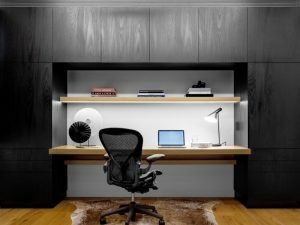 We’re used to seeing long islands that offer lots of workspace in a kitchen. 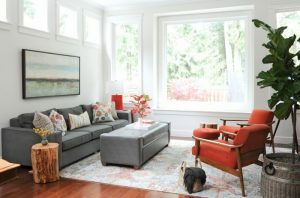 But here’s a smart way to make the most convenient and central space while providing for a casual dining area. 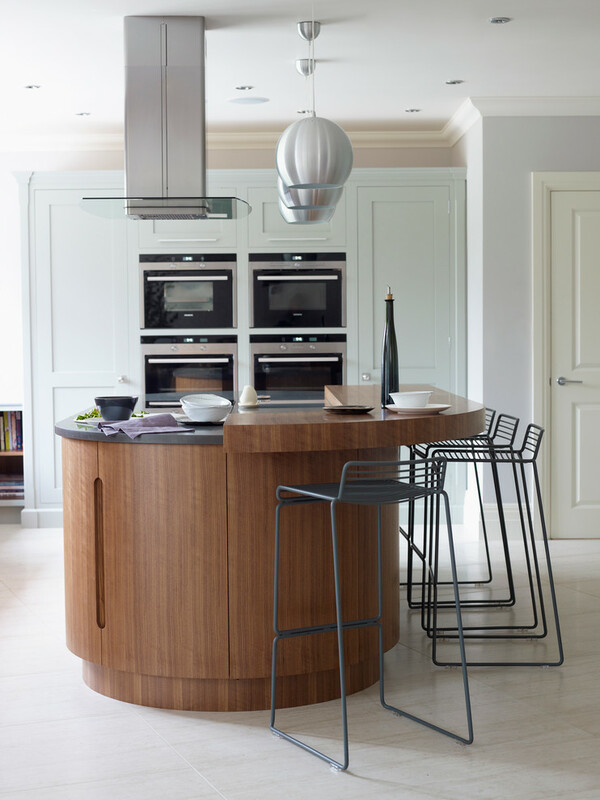 This curved kitchen island with medium size will still allow you to have enough space to work. The undermount sink and dishwasher are located on the island. To make a nice breakfast space, you can get sweet and colorful barstools for this island. 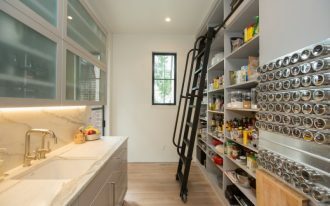 The combination of cupboards, drawers, and shelves in this kitchen provides optimum storage opportunities. 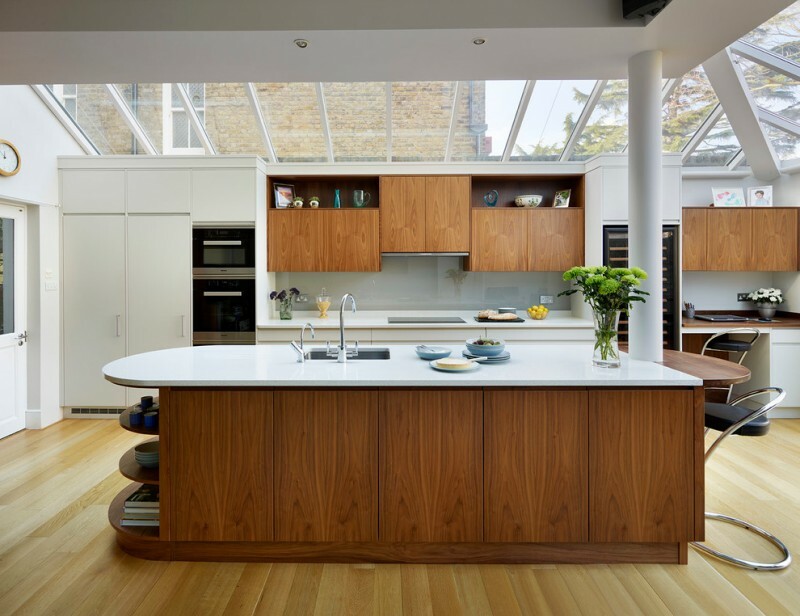 The furniture pieces with wood and white countertops in this kitchen look simple and interesting. The glass roofs with white frames will give the natural light in this room. 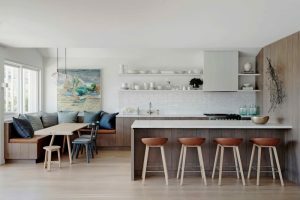 The curved shape of a kitchen island makes it look unique and young. This kitchen also features a curved kitchen cabinet, black countertop, glass windows, and glass sliding door. 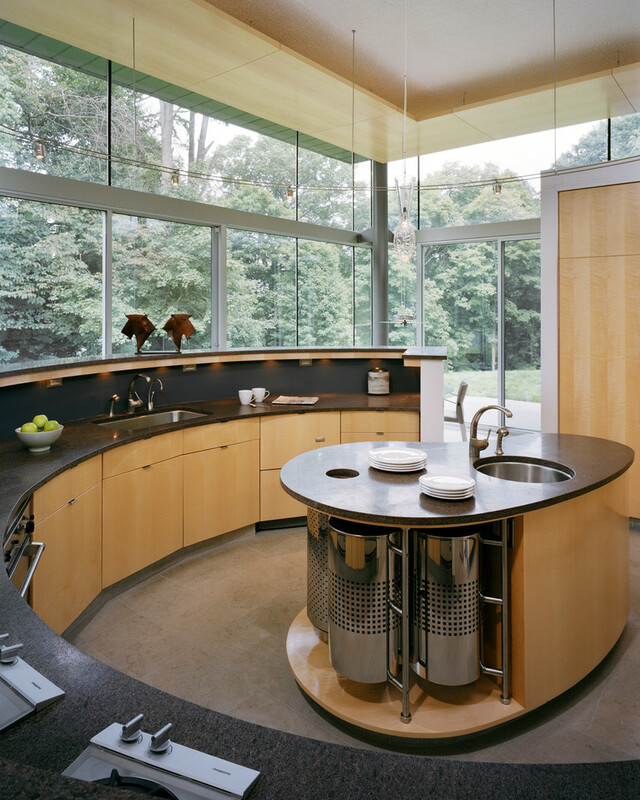 The circular metal bins in the island mimic the curves of the kitchen and add a slight industrial element in this space. 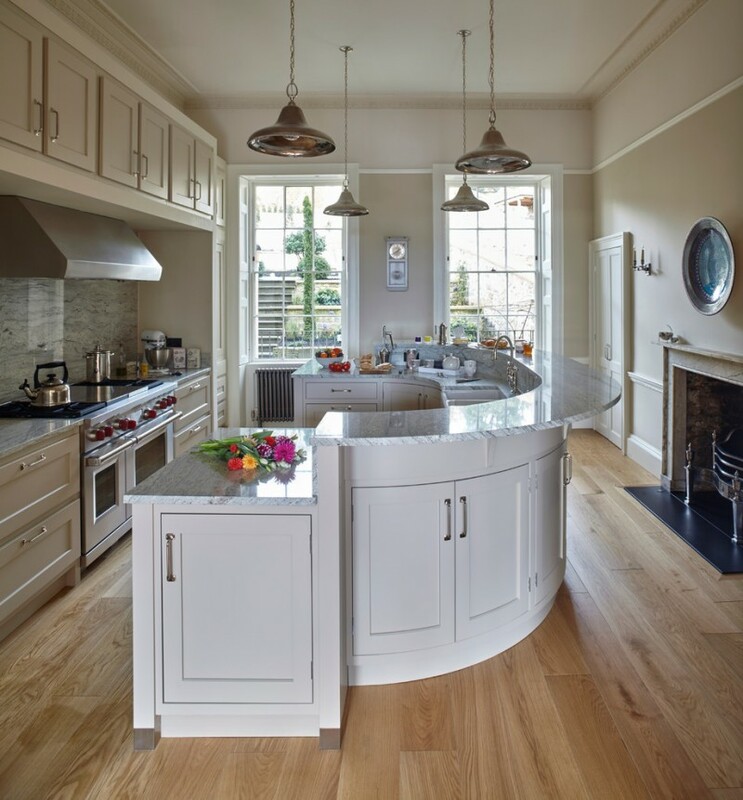 This white curved kitchen island really suits in this transitional space. This island placement is between the cream kitchen cabinet and a fireplace. You can also see the ceiling is filled with the gold rustic pendant lamps above straight above the island. 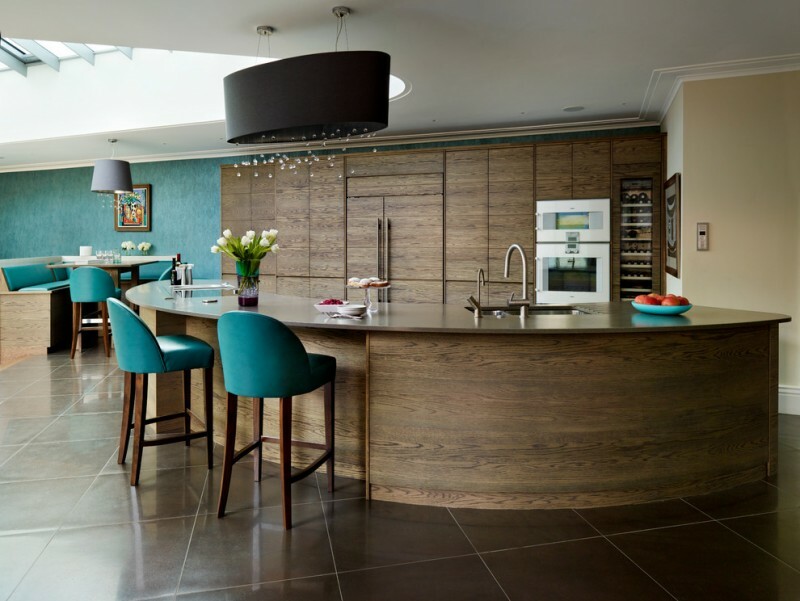 A curved kitchen island in a modern kitchen will bring a unique layout. 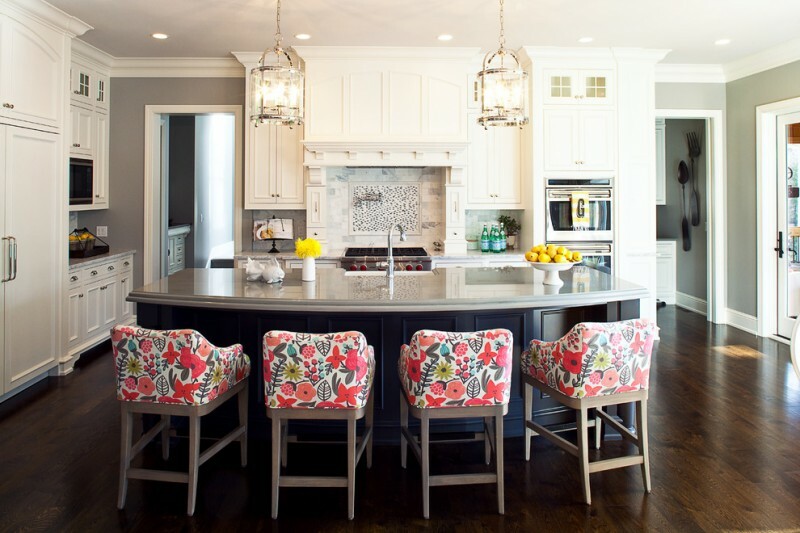 The color of the barstools suits the kitchen island well. You can find some drawers in the end of the island. This curved island has the same material as the kitchen cabinet. 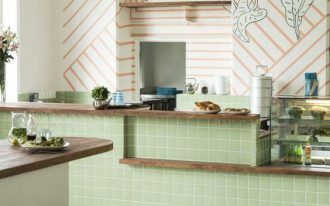 The turquoise accents come from the barstools, dining furniture, and the wall near dining space. This white curved kitchen island has a mounted triangle dining table. It is completed with the two white chairs. Above this beautiful kitchen island, you can find a Moooi Raimond pendant lamp. It is really suitable for the white island and has a beautiful pattern. 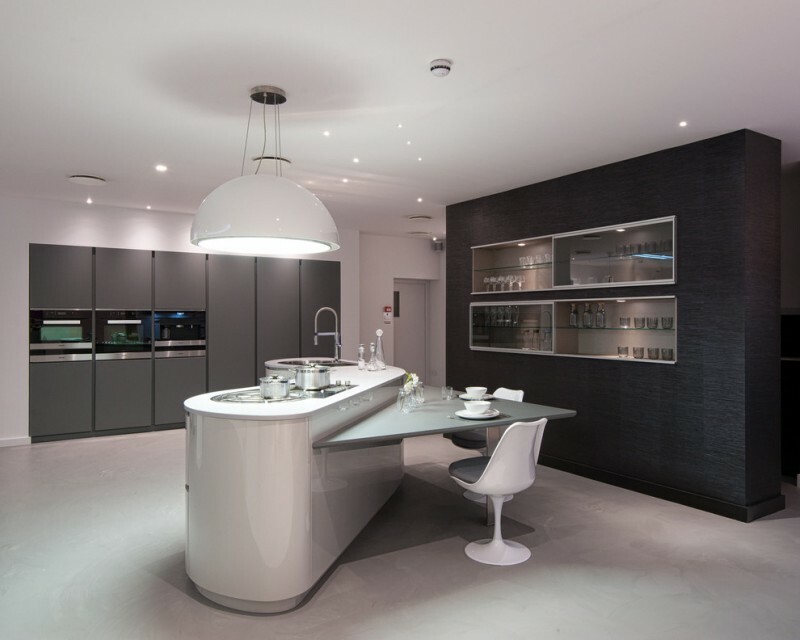 This kitchen has two curved kitchen island with different shapes. 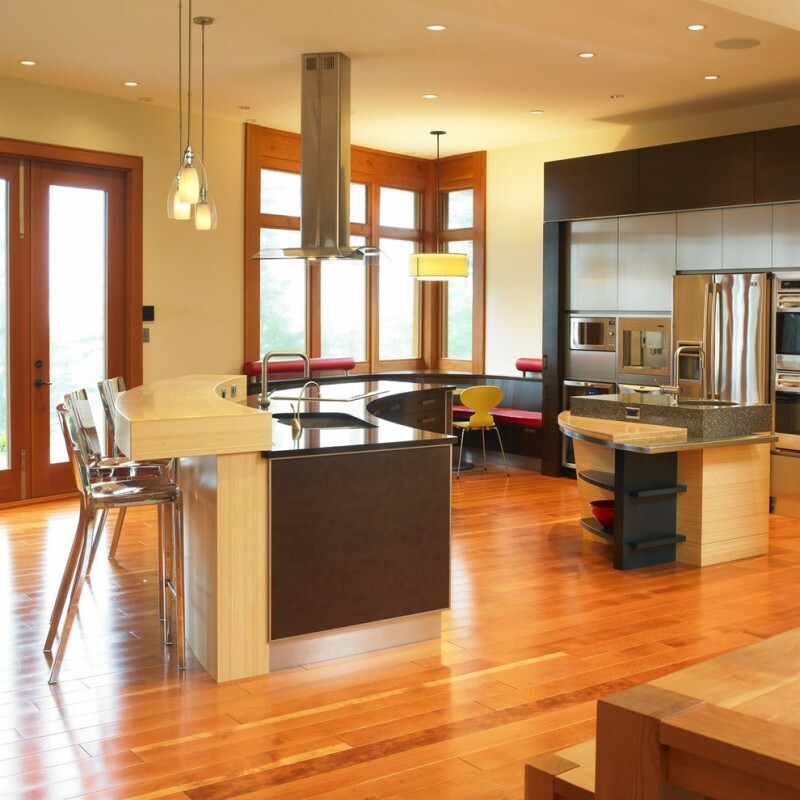 The big island provides an undermount sink, drawers, barstools, and kitchen pendant. While the small one, there are an undermount sink and some shelves.